Look at this dude going from Blank Page, to Skeleton Outline, to finished Page! Going from a completely blank page to a finished document is daunting for a lot of people. The good news is you don’t just have to sit there and suffer, staring at the blinking cursor or blank notebook. In this article we’re going through some of the time-tested methods to get you through this process while still maintaining your creative edge (and having fun writing)! Keep in mind, you should try a few strategies, and pick the best ones for you. Some will work for you and some might not. So read the article, try out the strategies, and then share your own ideas in the comments! Step 2.) It generates several hundred ideas for you. You can scan the generated list of topics it creates, and see if any jump out at you. Sometimes you can need to “see” a good idea, then your brain can run with it! So to write out this sales page, you just have to fill in a few paragraphs for each of these sections. That’s the beauty of a Skeleton Outline…it “chunks up” the work you need to do into logical pieces! This is a great strategy for writing headlines, but it works for whole articles, too. Inspiring Lens: Use a tone that helps inspire them to reach their goals. Benefit-driven Lens: Use logical and technical terms to describe the benefits. Different industries will require different lenses. For example if you’re selling fitness to super jacked dudes, an “Aggressive Lens” might work well. If you’re selling knitting accessories to nice old ladies, an “Inspiring Lens” might work well. Use one of these lenses to write through! Let’s say you’re writing an article about how to become a copywriter. The great part is that you can search for this topic, and then Google will give you the other questions that people ask about this topic! Google often GIVES you the questions people are most curious about! Copy these questions into your doc. As you answer them, you’ll be filling out the body of your article. Erase the questions, leave your answers, and BAM…your article is done. This strategy is similar to the previous strategy because it also lets Google do the work for you. Thanks for doing all the work for us Google! 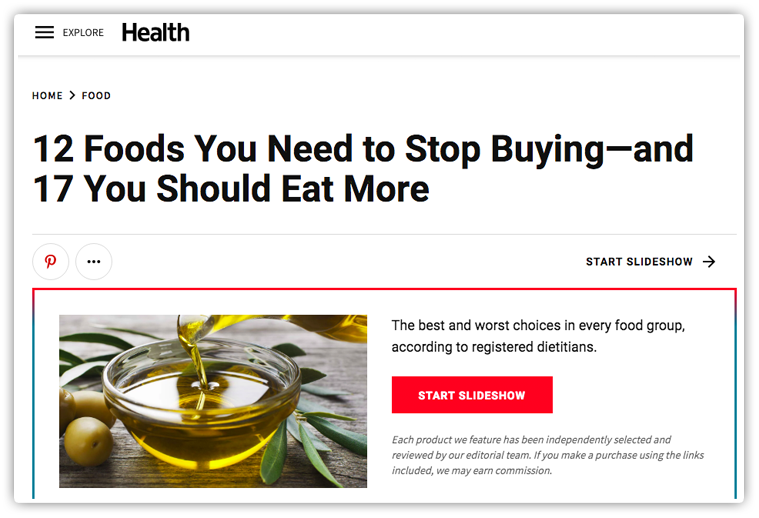 “12 Foods You Need To Stop Buying” is the Lock. “17 You Should Eat More” is the Key. This kind of “lock and key” article is all over the place because it works. It’s easy for the writer to write, and creates a headline that makes people click. Perfect combination for any busy copywriter. Call a friend on Uberconference (free) and talk about your article. Record the call. Get them to ask questions. Go get it transcribed on Rev.com and your article is basically done. Desire – Make your reader want whatever it is your selling: click a link, enter an email, even just to leave a comment. Answer, what’s in it for them? And what will they be missing if they don’t do this? Sometimes the hardest part is the first sentence. A writing prompt gets your “creative wheels” turning by giving you most of the first sentence. You finish it and keep going. This is one of the quickest and easiest ways to get ideas for your article. AND it can help you make sure your article is the best one on the topic! If you are writing copy about your new CRM app. Go search Google for “Best CRM software” and read all the top results that come up. You can go super in-depth on this process by checking out sites like Quora, Facebook groups, Reddit, and Twitter. See what people are saying about your topic, what questions they have, and use all of that info to write your bomb-diggity article. 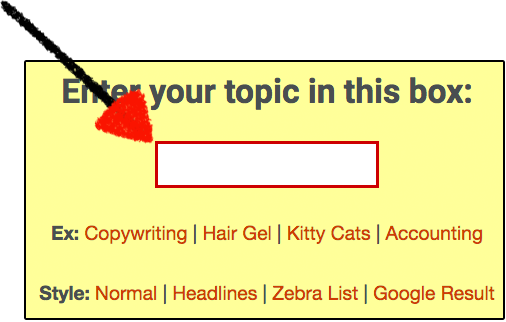 Use a Blog Idea Generator: Plug in your topic and let the magic blog machine do its work! Make a Skeleton Outline: List out the “bones” of your article, and have a set structure to fill out. Choose a “Lens” to write through: Angry, hopeful, mysterious…pick a tone and write like that. Use Bullet Points: Simple technique for the straight shooter. Make a list of questions (then answer them): Google tells you the questions people ask. Answer them. Use “Searches related to” on Google: Search for your topic, and get a bunch of sub-topics that people are looking for. Use those to fill out your article. Use a “lock and key” structure: Start with the bad things about your topic, end with the good stuff. Easy to write, easy to read. Don’t write anything…Talk instead! : Use that handy voice notes app in your pocket to “talk out” your article! Start with a writing prompt: Let someone else write your first line, then everything flows from there. Spy…I mean, “see” What other people are writing: Go check social sites to get ideas from others. Just don’t get trapped in an infinite scroll. Hope you learned and enjoyed! Before you leave, did you know we make a great training course and even help you write copy whenever you need? Writing website copy that makes sales or signups. Creating high converting blog posts. Writing autoresponders that automatically sends marketing and makes sales. Writing emails that bring in sales and attention. In the Member's Area you also get unlimited copy critiques, unlimited help, unlimited live office hours, and unlimited reviews of your content. If this sounds like something you'd like to start learning, take a few minutes to checkout The Kopywriting Kourse.